While I was planning the Trials of Everrun campaign I read a number of articles related to tips and tricks geared toward the new game master. Though I had been gaming – and game mastering – for nearly 12 years, most of those tips were geared toward new game masters. My goal was to totally re-invent my game mastering techniques from the ground up. One of the tips in particular stuck with me afterward, like a thorn in the back of my brain, constantly poking at me. The idea involved providing an XP “receipt” for the player, showing everything that the character did that game that was worthy of experience. I liked this concept, but I could not really make it congeal into something that worked with my game. So I stewed over it for quite some time – testing variations of it as we went through my Star Wars: The Role Playing Game sessions. I even created a Force Point and Character Point Tracking Sheet that I used during our last Star Wars game and found it to be fairly successful – but I wanted something more. By the time we reached the Trials of Everrun sessions, I was ready to start a more thorough version of using the Note Cards – and I really feel that I’ve hit onto something here. It has been a learning curve – and I will admit I have not yet mastered it – but it has already shown promise enough that I am ready to share. Character Name – At the top left of the card, I include the character’s name in big letters. I usually write it pheonetically so I can pronounce it if the name is strange (I’m looking at you, The Fez). Whenever I am addressing the character from an in-game perspective I do my best to address them as their character. Saying “The Ginger, you take 10 points of damage from the falling rocks” gets the point across, but it does little to provide an immersive atmosphere for the game. “Kaderin is caught up in the tumble of falling debris, taking 10 damage” is a bit more immersive to my ears. Init – 12 – That’s what I call the character’s “Base” initiative. As we get deeper into my game mastering style, you’ll learn that I do a lot of “behind the scenes” math for my characters. For all of that math, I have three values – min roll, average roll and max roll. For “Base” Init, I use the average. 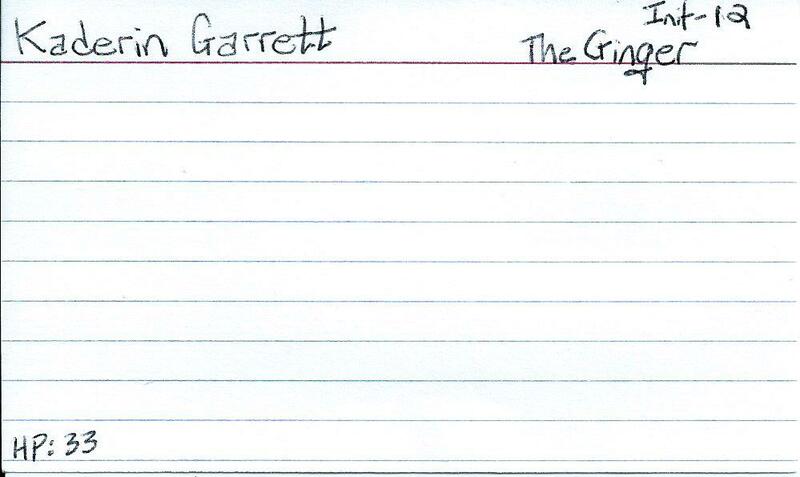 Because I have her character sheet, I know The Ginger rolls 4D6 for Kaderin in all things initiative. Assuming she manages an average score on her initiative, that means she gets a 12 (Rolling all 3s on 4d6). I use this value to determine basic turn-order during non-combat rounds. Player Name – This is just so I don’t forget who’s who character wise. This is more important at the start of the game, when I’m still learning character names for each player. HP – Again, because I have their character sheets I’m able to calculate their HP and keep it on the card. This helps keep me honest – if I see they’re hurting, and I do not intend to kill them in a particular encounter, I can ease off the heavy-hitting monsters. That leaves the rest of the card to notate what they do each round. At the start of the game I stack these cards up and put them in front of me – highest Init on the top and descending from there. I have a standard “NPC” card that is just there to hold their spot in the turn order, so I’m sure I don’t leave myself out of social or combat rounds. I hate when the players launch into a big discussion or series of minor party actions, and I forget they’re standing in front of a shopkeeper arguing about that orphanage they just burned down! In later sessions, I may start using this card to record the HP of each monster in each combat sequence – but for now I do that on a notepad. This example represents everything significant Kaderin did last game. You can see I do not go into a lot of detail – and without the other cards to see what was going on, there is not a lot of context. But I did not need a lot of detail – it is just there to serve as a reminder of what was going on. Also, you may notice that it jumps around a bit – I do not record every single round, just those that I feel are noteworthy. The card would fill up quick if I had a lot of “Talked to Jerrede.”, “Pulled out her bow.”, “Put away her bow.”, “looked at the walls for hand holds.” and other relatively minor actions on it. Instead, I only record the actions specifically relative to what is going on and the obstacle they are trying to overcome. 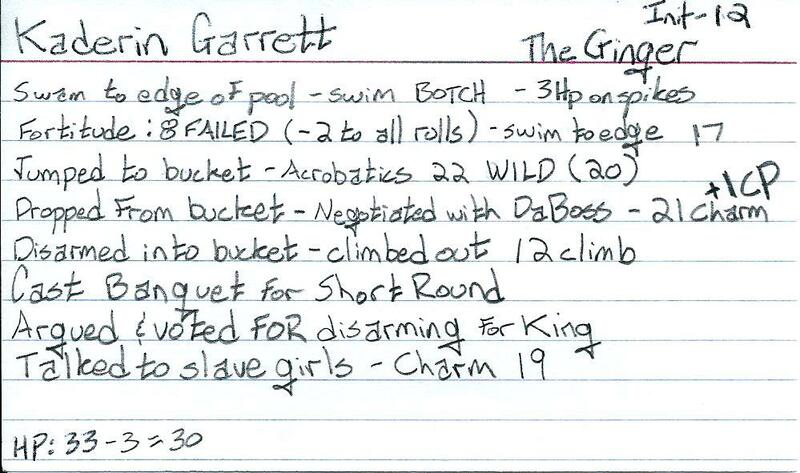 In addition to their actions, I try to record the outcomes every time a player rolls dice – like when Kaderin tried to jump into the low hanging bucket to get out of the sewage-filled Punjii pit. That will be important later. I also notate on each card what Character Points (see the +1 CP?) the player earned that game so I can quickly reference it later. This helps me keep track, so I can award them all at the end. I also record if they use a Character Point or Fate Point to modify the outcome of a roll or scene so I can remind everyone to deduct those as well. After the game – the real value of the cards. So you’ve got these cards with all this data on it, what now? Well, they’re a good audit when the players ask at the start of the next game “Hey, how many character points did I get last game?” or “How many did I spend?” And if that was their only use, I would have just continued with my Star Wars tracking sheet (above). But that is where the gears really got turning. When I am creating a new encounter, I reference the cards for the past few sessions. This is where the cards really come into their own, in my opinion. Whenever the players have to roll something – soak, archery, melee, damage, etc – I have a record of the outcome of the roll. That gives me a realistic expectation of what the players and the party can do in both social and physical combat. I can use this number to influence the stats of monsters and for planning out traps and other physical encounters – and have a reasonable idea of how they will perform before we hit the table. This allows me to make it challenging – but also to scale it to their current level. Nothing is more frustrating from a player perspective than a literally insurmountable obstacle where there shouldn’t be one, but from a game master perspective there’s little that is as frustrating as realizing you’ve set your difficulties too low! This also helps me to pace out the gaming session – if I know they’re going to get over the hurdle fairly easily, I will not dedicate a lot of time to it in my planning. However, if I feel it is going to be a major obstacle I’ll give some extra time to allow their creativity to work. Before each gaming session, I reference the cards for the past session. Before the players arrive, this serves as a quick reminder to me of where we left off and what I need to do in this session. As the players are getting situated, giving a quick theatrical run-down of what they did last session is a fast way to get them back to that level of excitement – and return them to their character’s mindset when we left off. For example, the bad batch recently fell into a pretty substantial pit trap that eventually spilled them into a punjii pit. However, due to the disrepair and slovenly state of the Dwarven city of Korrigan, the trap had fallen into hard times and converted many of their pit traps into cesspools. So, the would-be kings spilled down a greasy ramp to land – not on the bodies of the pit’s latest victims – but into a 12-foot pool of raw sewage. Their spill into sewage came right at the end of the session – and it is where I left them off. They were, in a word, disgusted by the turn of events. By re-reading the actions that got them there and recapping the events of the last session with some theatrical flair, I was able to quickly return them to that disgusted state – even two weeks after it happened! This led to some great Role Playing between The Fez and Leg Up as they both dealt with their filth-covered state in dramatically different ways. I couldn’t have done that without the cards.